“…as fabulously far-fetched as it is brilliant..."
Prelude is a “west coast concept”, a reference to Venice Beach CA, awash in organic salads, sun splash tie-dye and acid tabs – every John’s Place in the Sun. 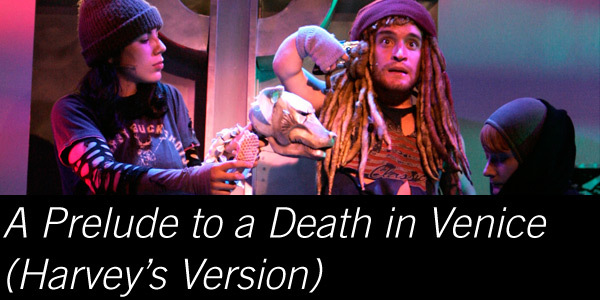 In an organic and quirky mix of drama, puppetry and film, A Prelude to a Death in Venice (Harvey’s Version) is a mythological passion of animal and man that rivals Tristan and Isolde in its iconic impact on western culture. Producer: Sharon Levy, Dovetail Productions, Inc.